These socks derive their name from the arches of leaves that make up the lace pattern. Knitted from the top down, a picot hem edges the lace, forming an arched cuff. 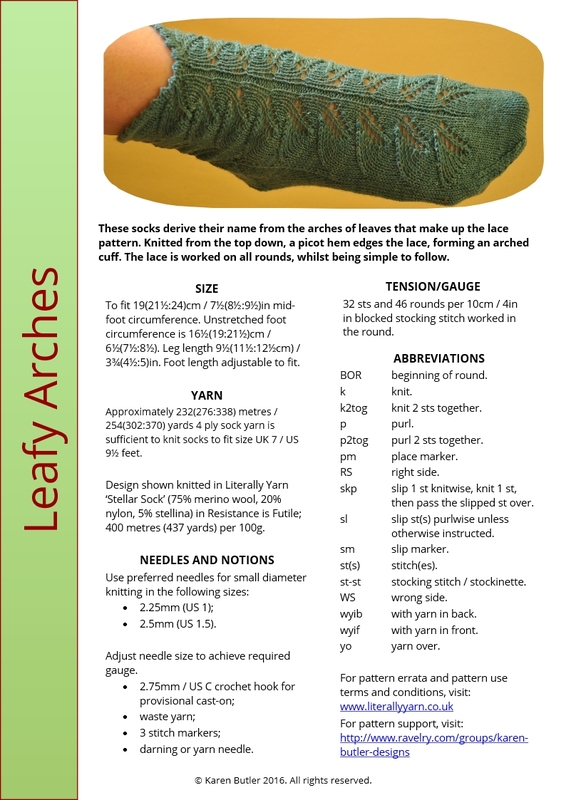 The sock leg is worked in the Leafy Arches Pattern; this lace is worked on all rounds, whilst being simple to follow. A slip-stitch heel flap follows with heel turn. Stitches are then picked up to work the sock gusset and instep, followed by the foot. Foot length is adjusted by working a stocking stitch section, with short rows, before shaping the toe. Pattern layout options are included for both A4 and letter size papers. The pattern is downloadable in pdf format and can be viewed using Adobe pdf reader. A copy of this software is available at http://get.adobe.com/uk/reader/. Images have been provided by Karen Butler Designs. If you are a member of Ravelry and would like this pattern to appear in your Ravelry Library, please let us know your Ravelry username when you place an order. To fit 19(21½:24)cm / 7½(8½:9½)in midfoot circumference. Unstretched foot circumference is 16½(19:21½)cm / 6½(7½:8½). Leg length 9½(11½:12½cm) / 3¾(4½:5)in. Foot length adjustable to fit. c. 400 metres (437 yards) per 100g skein, 1 x 100g skein. Tension 32 stitches and 46 rounds in blocked stocking stitch for 10cm/4 inch square. Design shown knitted in Literally Yarn ‘Stellar Sock’ (75% merino wool, 20% nylon, 5% stellina) in Resistance is Futile, 400 metres / 437 yards per 100g. The yarn used is hand-dyed Literally Yarn, which is only available in small quantities in any colour. Literally Yarn 'Solar Sock' and 'Nebula' Sock are alternatives.